US remake of 2004 French movie District 13. It's 2018 and things have gotten so bad in Detroit that a large area of the city, the crime ridden slum known as Brick Mansions, has been sealed off to protect residents of the more upscale downtown area. Undercover cop Damien (Walker) is assigned the unenviable task of entering Brick Mansions to deactivate a nuclear bomb that drug kingpin Tremaine (RZA) has unknowingly gotten his hands on. Guiding him through the hostile terrain is Lino (Belle), a resident of Brick Mansions whose ex-girlfriend is being held captive by Tremaine. The 2004 French action flick District 13 was a breakout hit internationally, so a remake seemed inevitable. Odd then that it took a full decade for this to occur. Back in 2004, the urban sport of free running was making headlines in every major city, whereas now it's just another forgotten fad, consigned to the past like a pet rock. Remaking District 13 in 2014 seems akin to re-marketing the Rubik's cube in 1993. The original film exploited the athletic abilities of its then 30 year old star, David Belle, one of the founders of the free running, or 'Parkour', movement. Now, at 40, Belle isn't quite so spry, so there's a bit less physical action asked of him, with quick edits and camera tricks helping him out. But he's still got enough left in his tank to make the rest of us feel out of breath watching him twist and turn his body in the film's many fun and well staged set pieces. Like its Gallic predecessor, Brick Mansions owes a lot to the eighties action films of John Carpenter. Its plot makes it practically an unacknowledged remake of Escape From New York, while its distrust of the upper classes is reminiscent of They Live, a film whose famous fight scene is replicated at this movie's climax when Belle and Walker have a heated disagreement on whether or not to disarm a nuke. 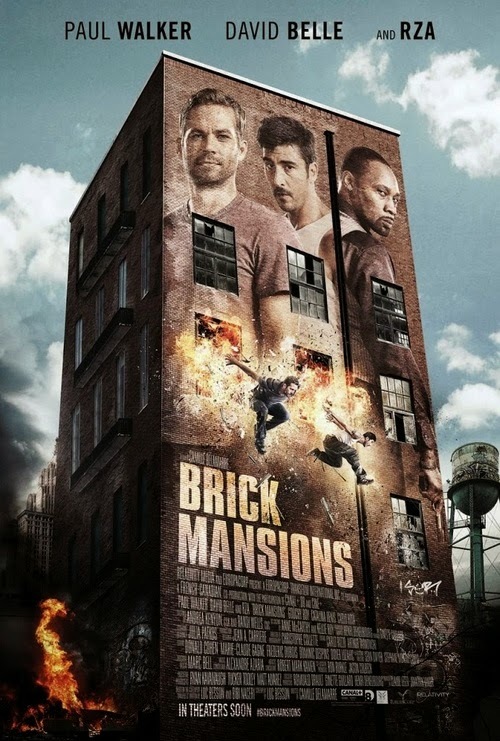 More so than Carpenter's work, however, Brick Mansions feels like a modern descendant of the many Italian produced rip-offs that hit the shelves of VHS stores in the wake of EFNY. The movie's got non-actors struggling with cheesy dialogue in second language English, henchmen played by impossibly large wrestlers and a villainous predatory lesbian who bears quite a resemblance to Geretta Geretta, the ex-pat African-American star of many a spaghetti sci-fi flick. Unlike most of Luc Besson's recent productions, Brick Mansions is a whole lot of fun, even if it is for all the wrong reasons. The dialogue features some of the most unintentionally hilarious lines this side of a 'Best Speeches of George W Bush' compendium, and the movie's ridiculously positive happy ending will have your jaw on the floor. This was Paul Walker's final film before his untimely death and serves as a sad reminder of what a likeable presence he was. There are few contemporary American actors who could fit this sort of role with such natural ease.